Twelve top melody flute bands gave exceptional performances at a recent event hosted by Lisburn Young Defenders. Although all performers are marching bands they were able to comfortably put on a stage performance offering a wide and varied range of music. Military marches, Traditional tunes, Sacred tunes and pop favourites were all evident on the day from bands who travelled from all over the province, and from Scotland. Richard Douglas, bandmaster of the R.I.R. Band, judged each band and had the unenviable task of deciding the winners. 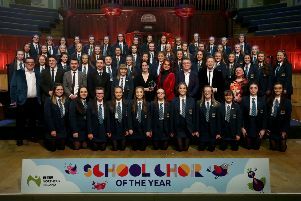 William King Memorial from Londonderry were declared the overall winners, with a number of other bands successful in specific categories. A thoroughly enjoyable day for all concerned and a shining example of the talent and ability in the local melody flute scene, which offers great opportunities for anyone wanting to get involved.